Gorgeous Plans for the High Line's Third Section Finally Revealed! Gorgeous Plans for the High Line’s Third Section Finally Revealed! After months of anticipation, Friends of the High Line has finally released images of their plan for the last installment of the city's famous elevated park. DNA info's exclusive pics show that the third and final section, called "The High Line at the Rail Yards" will flow in seamlessly with the rest of the park's design. Following the space's iconic train track rails and featuring benches, tables, and children's play equipment that sprouts right out of the floorboards, the outdoor oasis will also work in sync with the Hudson Yards Project, a plan to build 16 new skyscrapers in Hell's Kitchen in hopes of creating a new and improved Midtown area. The High Line’s final section will follow the rails from West 30th Street to West 34th street and jut out from 10th to 12th avenue. The current plan is to weave the green pathway around the proposed skyscrapers, creating a new and vibrant neighborhood not unlike the fate of Chelsea when the High Line began. Mayor Bloomberg has long had his eye on this industrial area, making plans left and right to revitalize West Manhattan and calling it “one last frontier” on the island. The High Line will not only include seating areas for adults, but also a large play place for children, with rubber climbing beams. Plans are expected to be finished within the next year or so, with a slated opening date of Spring 2014, but thankfully we won’t have to wait too long to sneak a peak! The Friends of The High Line will soon open the walkway as is for visitors to experience the wild, natural overgrowth that currently overruns the rails before major beautification begins. The High Line's final section will follow the rails from West 30th Street to West 34th street and jut out from 10th to 12th avenue. he current plan is to weave the green pathway around the proposed skyscrapers. 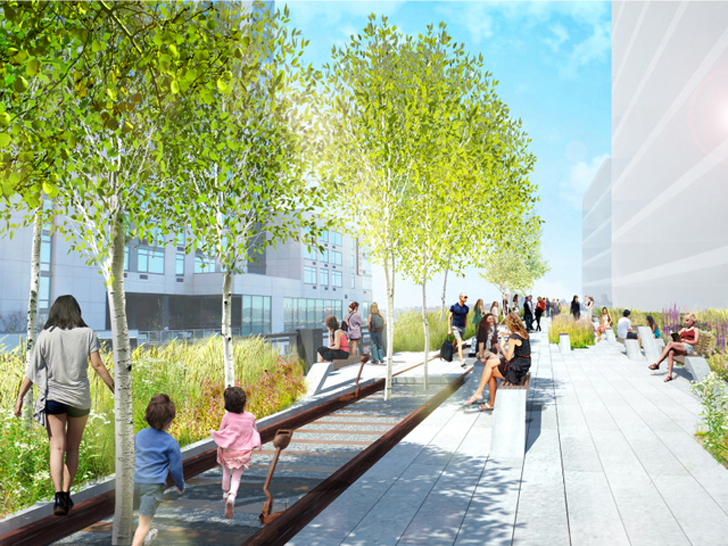 The path will hopefully create a new and vibrant neighborhood not unlike the fate of Chelsea when the High Line began. Mayor Bloomberg has long had his eye on this industrial area, making plans left and right to revitalize the West of Manhattan and calling it "one last frontier" on the island. The High Line will include more fun seating areas for adults. Rubber climbing beams inside and along the walkway will entertain children. Plans are expected to be finished within the next year or so, with a slated opening date of Spring 2014. Thankfully we won't have to wait too long to sneak a peak! The Friends of The High Line will soon open the walkway as is. This way, visitors can temporarily experience the wild, natural overgrowth that currently overruns the rails before major beautification begins.